[TransX] TransX planning - IMFD burning : how to burn in IMFD a transX plan ? TransX planning - IMFD burning : how to burn in IMFD a transX plan ? Hi everyone ! I've been a long time reader of this wonderful forum, where I learned almost everything about orbiter. But now, with my little orbinaut experience, I'm stuck with something and it pushes me to write my first message. I'm trying to do a powered slingshot of Venus, in an Earth-Venus-Mars trip. As I've learned here and there, IMFD (still working on it) isn't efficient in terms of slingshot planning. Though I've already found a window using guess and check in TransX. But here comes a few questions : I don't manage to export my data's from my 'plan" to IMFD, and I really don't understand how to interprate transX plan for each step, in order to use IMFD like a DSKY P30 flight computer and set up the delta velocity program according to transX values. Maybe I'm not reading the correct values, or I missed something. 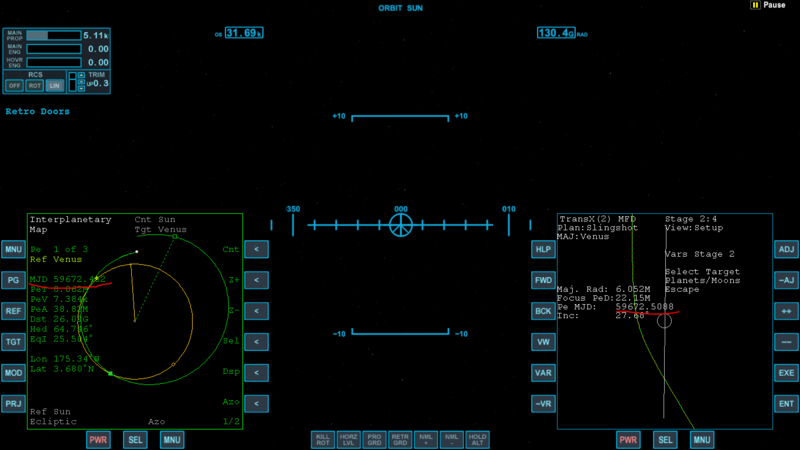 For instance : on the ground, I would have like to use IMFD to launch, since you can check in real time your Ein. Using the target intercept program, tgt Venus, set Tej and time of encounter according to the transX plan, I have different Rinc and Ein values transX escape plan window and surface launch program. Again, once in orbit : I've tried to copy the data from the transX escape plan to IMFD in order to do the ejection burn. I've read on the forum many methods, but any of them seem to be working : Copy the total delta-v from the escape plan to the Dvf value in delta velocity program, then set the Tej. according to Time to Pe. from transX. Once burned, I'm off from 15 degrees in S. Maj axis diff. I've also tried to copy each value from the eject plan (prograde, Ch. Plane, outward) to Dvf, dvp and dvf, setting up the Tin to the time to Pe. I beautifully scratched in the Pacific, as IMFD burned straight into the planet. I've seen on the forum many messages about a combined use of these tools, but I can't find out how to export to IMFD the slingshot attitude. There are tutorials about one or the other, but I didn't find one that described a simultaneous use of IMFD and transX. May anyone help me deal with it ? Thank you all for your help, have a good weekend. I can't help much with your main question of transfering TransX flyby data into IMFD, but I thought it worth mentioning that when transfering burn dV parameters between TransX<->IMFD (e.g. Forward, Outward, Pl.Change) you need to invert the sign +/- of the Outward and Pl.Change values. I think that's correct. I beautifully scratched in the Pacific, as IMFD burned straight into the planet. I think this may happen when the Tej is big. I got into the habit of not hitting the AB button before passing the node just before the burn, usually a quarter orbit or so. If your Tej was bigger at the time of pressing the AB button, you can try pressing the AB at a later time to see if that makes a difference. @BrianJ Ok I didn't notice that transX is giving for instance an outward velocity, whereas IMFD'Dvi stands for inward. But still, the problem is that in TransX escape plan, you only have a positive prograde dv. If you look at the eject plan (step 2) of the scenario, you'll see that the prograde velocity is negative. I assume that the difference is relative to the reference body used at each steps of the plan : in escape plan, you have a positive prograde Dv relative to earth in order to eject the shjp, but this means that relative to the sun (in the eject plan) you're slowing down, correct me if I'm wrong. I'll give it a try setting the delta velocity program reference to sun and try to input the eject plan variables (inverted or not) instead of the escape plan Delta v value. But still, I cannot use this program correctly combined with the map program, because I don't know the attitude of the slingshot from the transX plan (Inclination and PeD). So even if I set up these variables, I would not be able to "check" with the map program that I'm ejecting/targeting/approaching Venus on a good trajectory. @bcbarnes Yes I've already seen many times both his beginner guide, the trip to Mars you're mentioning and his tutorial with Dimitri (dgatsoulis) about IMFD. I've performed several trip to Mars using these MFDs and making them working together. But David Courtney's video don't describe a slingshot, it's a Earth Mars trip. As I've said, my problem is specifically the combined use of transX and IMFD while performing a slingshot. If your Tej was bigger at the time of pressing the AB button, you can try pressing the AB at a later time to see if that makes a difference. Thanks for sharing ! We would have done a great Mission Control work you and me I think my mistake is somewhere else, each time I tried I really waited the last moment before activating the autopilot, like 300 seconds before Tej or so... And since it was a huge deltav maneuver, I also divided it into two burns : one orbit before Tej, apply some Dv to reduce the total amount while checking that your Pe MJD is matching with your plan ejection time. Thus it's a good way to cut in two smaller burns a huge one. Let's try break it down a bit. The trouble begins with the ejection burn to Venus, right? What does IMFD's map program look like when you set up this burn in a 2nd MFD slaved to the DV program? It should give you an accurate visual representation of the trajectory. If the trajectory (in blue) doesn't look right, I can imagine the MCC will be expensive. Sorry for this, I tried to give you the most accurate information. I already configured IMFD with these parameters. For the eject burn here is how I proceed : taking note of the Delta v value in transX escape plan, I start Delta velocity program. Here I input as Tej the T. To Pe indicated in TransX, and the Delta v in Dvf field. I can see correctly my trajectory in the map program once shared, but 1) the Pe MJD is far off the value of transX, and 2) once performed, the trajectory shown in transX escape plan with the green line is really off the planed trajectory in yellow. Obviously, it will take me to Venus but not with the good attitude, not with the good PeD, and at the wrong date. Am I proceeding correctly for the moment ? To be sure this odd behavior is not your problem, find a real or online stopwatch and time the burn. Check whether an IMFD second has the same duration as a real second. You may be surprised. To deal with this, set up te burn (using off-axis), quit orbiter, resume the current scenario and do the burn. Check te DV values before burning to see they didn't change upon resuming. 2 is probably the result of not solving 1. As long as IMFD Map program tells you something is not right, something is not right. That includes the time of arrival PeT. There is no point proceeding if this value is not what it should be. Here I input as Tej the T. To Pe indicated in TransX, and the Delta v in Dvf field. I suspect the problem is here. Tej = Time to Ejection, while T to Pe is the time to Periapsis. This is only true if the ejection point exactly the same as the periapsis of your current parking orbit, which is likely not the not be the case. Set Tej in IMFD to equal the time until burn shown in Trans-X. Hi everyone ! Sorry for my absence, I was abroad last week and I have not had time for orbiter. Thanks for your really helpful answers I have done a few tests yesterday with your advice in mind. I've done the check you mentionned... what a huge gap With this method I was able to minimize the error margin. So this part is ok.
Set Tej in IMFD to equal the time until burn shown in Trans-X. Thanks ! At the beginning I tried Tex's method to 1) reduce the total time of burn (divide it in two) 2) reduce the amount of Dv needed for plane alignment 3) Be sure that PeT and Begin burn are matching. But this is definitely, in my opinion, a loss of time. Finally, I used the traditional method : use Begin burn value to match IMFD TEj. AAANnnnndd finally, the "first part" (ejection burn) was successful. You can plan a slingshot in TransX, then perform it in IMFD (to take advantage of the auto-burn and IMFD Map's greater accuracy). You will need to know the TEj (when you leave the first planet), the "swing-by date" (TIn for the first leg, also the TEj for the second leg), and the swing-by altitude (used in Planet Approach when you near the "sling" planet). But precisely : how can I take advantage of IMFD's Map program if I don't know the correct values for PeD, Pe MJD, Rin, etc.... ? This is really what is confusing for me and I don't understand what you had in mind. How to set up one ejection burn which will take me to Venus with almost no MCCs, matching the TransX plan even if its inaccuracy may tell me i'm not on the good trajectory ? To conclude, here are some screenshots after a MCC illustrating my lack of understanding. In this situation : R.inc is at 0 and Pe/ratio is at 1 so everything looks good. Thanks everyone for your help. If I manage to understand this, I'll try to make a full tutorial of a combined use of TransX and IMFD while performing slingshots, I think it might be useful. Last edited by potjoe; 11-19-2018 at 07:39 PM. Can you post your scenario? Maybe it's an idea to fetch a Earth-Venus-Mars trajectory from Nasa's trajectory browser. It would give you some reference. I had look, but there is no trajectory with route EVM in the database it seems. The scenario is attached to the first post ! Actually the TransX plan I set up corresponds to a valid windows found in trajbrowser. You may have done a mistake, cause I found the window thanks to it. Last edited by potjoe; 11-19-2018 at 08:01 PM. I tried various queries. Can you look it up and post the link here? Nice catch. Putting in Venus and Mars in the custom list should just add the trajectories for venus and the trajectories for mars together in a single list and not result in combined trajectories as far as I am aware. Anyway, for the first segment of your trip, I think you should use IMFD's Course plan to find a solution which actually matches the 4.17 km/s for the burn to Venus, or something very close to it. You can grab these from the browser. Periapsis height is also given by the Trajectory browser, expressed as 2.75 radii altitude. Did you know there is a lot more data hidden in the source code of the page? All the state vectors are there for example. Also, the timestamps include hours, minutes and seconds. This data is lost if you would just convert the dates given on the page to MJD's for use in IMFD.